This breakthrough guide from NFPA helps inspectors conduct--and contractors pass--electrical inspections -- in Spanish! 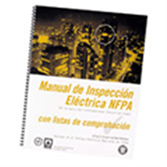 The Spanish edition of NFPA® Electrical Inspection Manual with Checklists spells out inspection points of the full range of electrical installations. More than a valuable guide for today's electrical inspectors, it's a unique inspection planner and organizational tool that every contractor and project manager needs! Checklists are included for the full range of residential, commercial, and industrial installations. The spiral-bound Inspection Manual is divided into 11 general chapters, including Grounding; Residential (featuring expanded lists for rough and finish inspections); and Commercial and Industrial Inspections. Each chapter contains multiple comprehensive Checklists used for conducting specific inspections. You can easily extract the information you need.